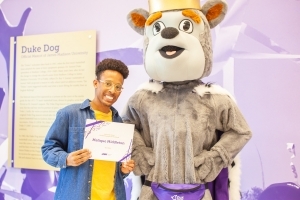 Malique Middleton is a sophomore biology major at James Madison University and April’s University Unions Employee of the Month. This year, he served as Student Assistant to the Coordinator at the Dux Leadership Center. His reliability, maturity, and authenticity are a few qualities that reflect the mission of Dux and make him such a valued team member. Malique goes above and beyond what is expected of him. His attention to detail and the passion he puts into every project make him stand out in the community. Whether it’s providing a new perspective in the office or listening to the needs of others, Malique gives every effort his full attention. He goes above and beyond what is expected of him. If there is a need within the office, Malique makes it his mission to develop solutions either by reaching out to members of the JMU community to survey for possible areas of improvement or working with other students to create systems that make office responsibilities easier. Malique’s passion and personality shine through in everything he does. He will soon be serving as a Leadership Counselor with Make Your Mark on Madison. There, he will continue to develop his own leadership and help give underclassmen the same drive and passion that he possesses.